Hi! 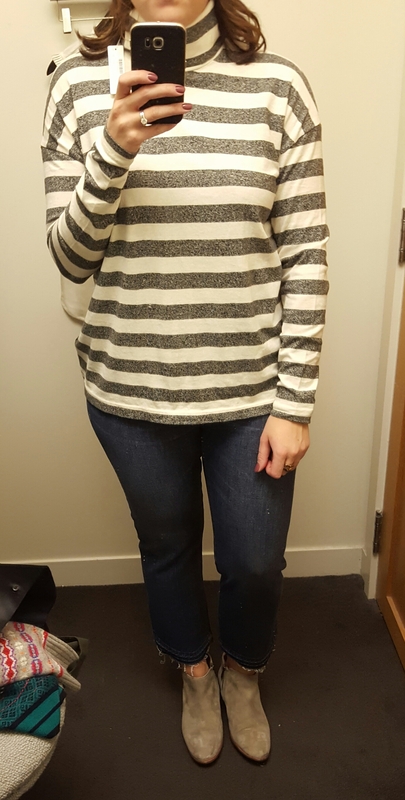 As promised, here are the rest of the photos from my latest try-on session at J.Crew featuring items from the December 2016 style guide. Apparently we will have another rollout to look forward to the week of November 21, featuring more sweaters and seasonal items. Woo hoo! First up, the Waffle T-Shirt in Stripe Combo. This also comes in a green/yellow/white/navy stripe combination. Yes, I know. Stripes. I purged several striped items from my closet yet I seem to have re-accumulated more. This is a smaller weave waffle knit (not sure how to accurately describe it). It’s not as nubby as some waffle knits but it’s still technically a waffle knit top. I could tell looking at it on the rack that it ran a bit small so I’m wearing a size Large and it fits if not a bit on the snug side. But I found the longer length to be slimming and for the price point with the in-store discount, this came home with me. I’m also wearing the Billie Demi-boot crop jeans in Brookdale wash in a size 32. I have the white ones from over the summer which were a bit big in a 32 and stretched out a fair amount so I had originally tried/returned the 31s in these because they were a tad snug. I hadn’t worn them for several weeks so they went back but I still have my eye on them. Next up, the Regent blazer in Black Watch with satin lapel. I am a recent convert to the Regent blazer. I had a few from last year but my first purchases were the heavier wool Regent blazers and I hadn’t quite wandered over to the lighter wool versions. Well, I love them, and this was no exception. I’m wearing a size 10. This has a black satin lapel. I have a Black watch Schoolboy blazer from Factory so I don’t need this but I won’t lie that I spent a long time deliberating over having two black watch blazers. But, their season is limited so it was a pass. If you’re in the market for a plaid blazer, this is a fantastic style and I find the plaid to be a little more muted and very versatile. Keeping in the vein of Black watch plaid, next up is the Black Watch Excursion quilted vest. I’m wearing a medium in this vest and it is a good fit. Another thing I don’t need are more Excursion vests but I’m liking the colors and patterns offered this season so I wouldn’t be surprised if one gets added to my closet before the end of the year. I really like the Emerald pool color . Next up, the Tippi sweater in festive fair isle. This was ok for me. I don’t mind the print but I didn’t love all of the stripes on the sleeve. I’m wearing a medium and could have sized up to a large to layer another shirt under it which is probably how I would wear one of these printed Tippi sweaters. I think I own more Tippi sweaters than Excursion vests and striped shirts put together so…I’ll leave this one. Next up, the Lady Jacket in Metallic Tweed. The photo really isn’t doing this jacket justice. I’m wearing a 12 and it is a little too cropped for my liking. If it came in tall I think that would be perfect. I do like it over the longer black top though and perhaps would pair with a black suiting dress or a black sweater/pants. There is a coordinating dress in this same tweed, which they’re calling shimmer tweed (again with the different names for the same pattern!) Up close, it is fairly metallic in person but not obnoxiously so and I thought the tweed was very pretty in real life. There’s quite a bit of silver in it but it looks more grey from a distance. The inside of the jacket is lined in a pinstripe material. The sleeves in the website photo make it look like the fringe is really long but I didn’t find that to be the case on this one. I tend to like a more form fitting jacket so these styles are usually a pass for me. Next up, the Holly Sweater in Fair Isle in pebble mist. This also comes in a bright red (poppy hazelnut) with a lot of other very saturated colors. I am wearing a medium in this sweater and was running out of steam at this point and didn’t try the large for comparison. I tried the Holly sweater last year and also found it short. I would probably layer another longer button down under it to compensate for the length and I may try a size up for a little more length but even though I had seen some reviews say it seemed a bit longer, it’s still slightly cropped on my 5’8″ frame. The wool wasn’t terribly scratchy but I also tend to not be too overly sensitive to wool. And one more striped top – the Oversized striped turtleneck. I have last year’s version of this top (of course). I like the wider stripes and also the camel/navy combo but I resisted this one. I’m wearing a medium which was still slouchy but I like that the sleeves are a bit more fitted to balance out the loose body of the top. This year’s version seemed softer to me than last year’s version too. Last up, the lace peplum top in Fuchsia bloom. I tried this on to compare the difference between the regular and tall version. It looks ok in the photo but it definitely felt short on me. I’m wearing a 12 and had some room through the chest as well but I couldn’t have sized down in the regular length. I do like the bright pink – it reads more summer to me but I’m always a sucker for hot pink and let’s be honest, if this hits a good enough sale it’ll probably be mine. In the meantime, I’m happy with my decision to purchase the black. And the lace matches last year’s lace items so that’s a plus. Well, that’s it for now…any favorites from this rollout? Would love to hear what you think and thanks for visiting! Your waist is so tiny!! Especially in the waffle tee. That top is so flattering on you!